Google Now is a powerful tool but there are some obvious gaps in its functionality. One of the biggest is the ability to control media with it - one hole that Google might be planning to plug. 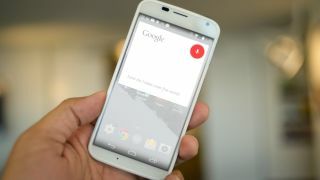 Android Police was alerted to the fact that some devices now allow you to control music by giving commands to Google Now. So far it seems to understand 'Next song/track', 'play next song', 'stop music' and 'pause music', however it doesn't work for everyone. We tried it out on an HTC One and were told that 'controlling media is not supported on this device' but the hope is that there'll be a wider roll-out soon. Obviously if you're just using your phone as normal it's not terribly useful anyway, but if you're using it hands free, for example when driving, it could be very handy. But we suspect the real reason that this feature is being implemented is for the new wave of Android Wear smartwatches. They have physical music controls, but it would probably be easier to use voice controls. These new controls could come in handy with the LG G Watch.